I first discovered Glassworks, a make-your-own glass fusing studio in Morristown, NJ, about 10 years ago. I went with about 15 other women from my synagogue to create a handmade piece of art to be donated to a new Habitat for Humanity house. The founder and owner of Glassworks, Stacey Schlosser, walked us through the project, explaining that we'd each design and make a fused glass tile that would then together be placed around a mirror for the family moving into the new home. We were then set free to design whatever our hearts desired. I remember the initial elation of being given free rein to create anything; then my mind was full of nothing! So many choices! So many colors, patterns, designs! I was quite overwhelmed. Slowly but surely, each woman created her own tile to add to the mirror. Some placed precut glass pieces, strands, and gems in patterns; others recreated an inspirational picture they brought or saw in the studio; others used the glass to designed their own scene, such as a tree or people. At the end of the night, we each had glued our pieces to a glass tile, which was fused together in the kiln over the next week, and then used to frame the mirror to bring personal art into the new home. I was eager to return to design and make my own fused glass creation, but I decided to wait a few years until my kids were old enough to experience it with me. Glassworks offers a wide variety of projects for everyone ages 3 and up, so fortunately, I didn't have to wait too long. Younger kids can easily work on the precut kits. My daughter, who was about 4 at the time, picked a cupcake kit, and my son (age 6) chose the gumball machine kit. Each kit contained a base piece, precut glass pieces, and a drawing of where the pieces should be glued on the base, similar to a puzzle. I guided them as their little hands glued each piece down. My son also chose to add his initials with glass strands. About a week later, we came back to pick up our fused pieces of art. The kids were so pleased, and, to this day, display them in their rooms. A few years later, they were ready to tackle a project that allowed them more freedom over the design. My son was also old enough to try to cut the glass himself (while wearing protective glasses and with close parental supervision, of course!). My daughter designed a butterfly using colored glass strands, pieces, and gems. My son got a template of the Phillies "P" symbol, and filled in the letter with bits of red glass. The designs were fused and molded into little dishes to hold jewelry or trinkets on their dressers. Recently, my very creative mother-in-law came to visit, and I knew we had to take her there. She felt the same overwhelmed feeling of creativity overload, but she and the kids worked together to design and make a beautiful serving tray that now graces her entrance way table and reminds her of when she and her grandkids created art together. One of my favorite things about Glassworks isn't necessarily the final product, though you are sure to create something beautiful and meaningful. The thing I think most people appreciate is the process of getting to that final piece. For me, I treasure time creating art with my kids, and I love watching how their minds work as they design their piece. Each object captures who they are at that point in time. Watching my kids and their grandmother work together on a project was a delight, as well. And creating alongside the women from my temple was a great way to get to know them and feel that we brought beauty into someone's new, hard-earned home. Though I haven't ventured into Glassworks alone yet, I would love a quite afternoon there to discover what my heart would create. Every experience, just like every final product, is uniquely beautiful. Glassworks is located at 151 South Street, Morristown, NJ. For more information, visit www.umakeglass.com or call 973-656-0800. Projects range from $23 to $150. 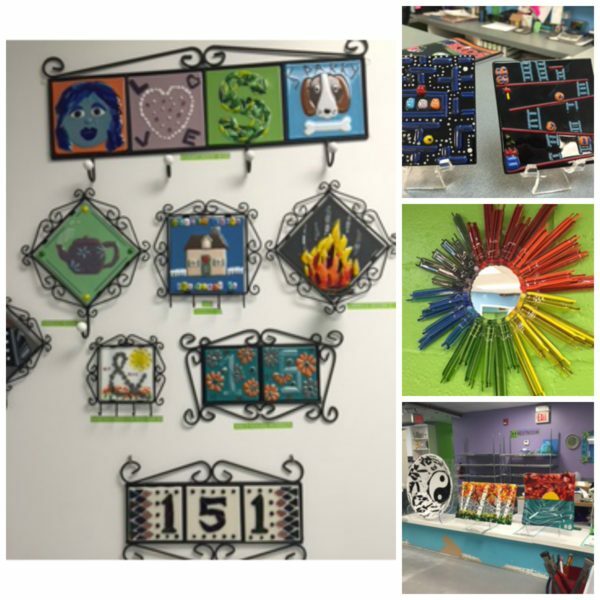 Glassworks offers open studio time (reservations are always recommended), kids' events (birthday parties, fieldtrips, fundraisers), adult gatherings (adult nights on Wednesdays, corporate groups, and private and semi-private parties), and workshops (for adults, kids, and families). Upcoming kid workshops include a Santa's Workshop drop-off during Teacher Convention (Nov 10 and 11), and a free-form hanging letter workshop on the evening of November 18.